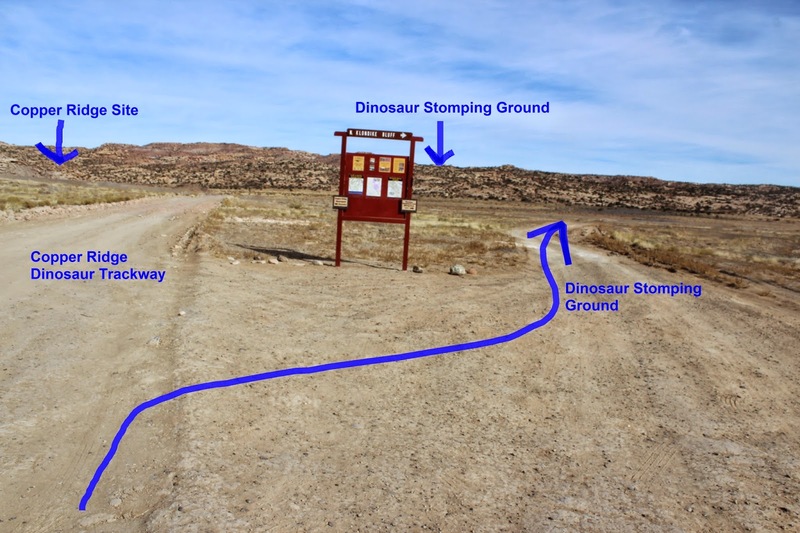 The Dinosaur Stomping Ground is located in the Klondike Bluffs area about 23 miles north of Moab, Utah. A hiking only trail leads through the Klondike Bluffs Mountain Bike Area to several dinosaur trackways and individual dinosaur prints. Many of the tracks overlay one another giving one the impression of dinosaurs wondering about the area going back and forth and hither and yond. The Dinosaur Stomping Ground is only about a mile or two from the very popular Copper Ridge Dinosaur Trackway. Both sites can easily be visited on the same trip. 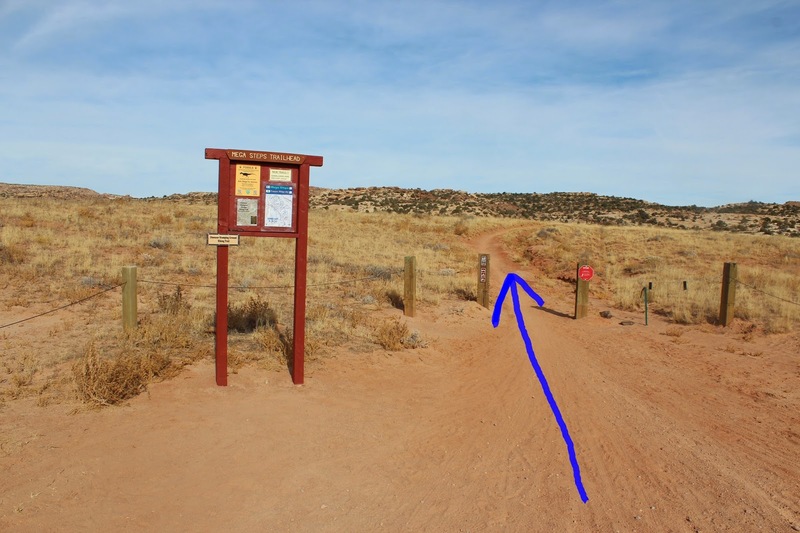 To get to the trailhead either drive 23 miles north from Moab or about 9 miles south from the Crescent Junction exit on Interstate 70 and turn east at the North Klondike Bluff sign. Cross the railroad tracks and follow the dirt road for just over 1 mile to the fork in the road in the above picture. The left fork leads to the Copper Ridge site, where there is an outdoor privy, and the right fork leads to the Mega Steps trailhead. The dirt road has enough rock in it that it stands up pretty well in wet weather but there are a few spots that are impassable for passenger cars if it gets too wet. The road continues past the Mega Steps trailhead which can make it a little confusing for which way to go but all of the trails are found off of the single track behind the trailhead sign. The trail heads toward the slickrock and drops down into a wash where it bumps into the Dino Flow trail. From there the two trails go a few yards together and meet up with the Mega Steps trail. From here the Dino Flow trail continues south along the base of the bluff. The Dinosaur Stomping Ground trail follows Mega Steps for a short distance before it departs to the left and heads out on its own. The trail parallels Mega Steps for a little ways. As it drifts away it ends up crossing the Alaska trail. 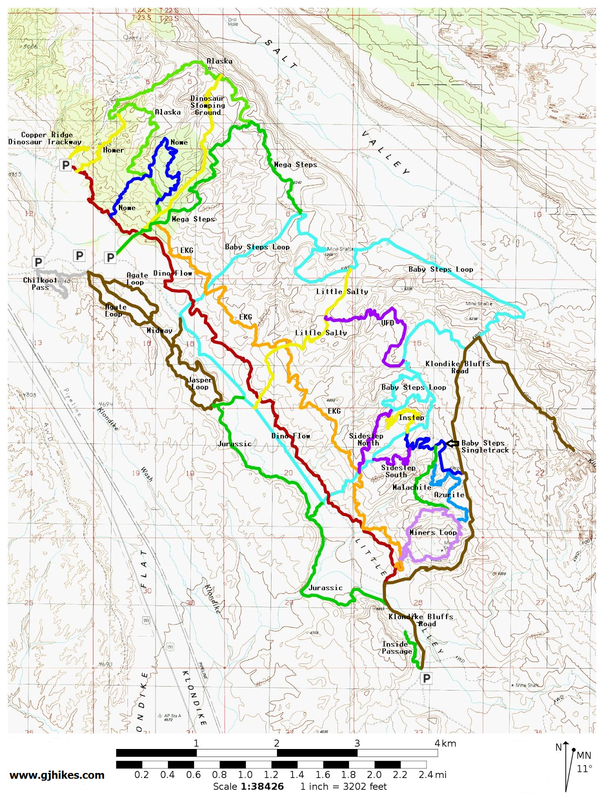 The trails in the Klondike Bluffs area are all color coded. The Dinosaur Stomping Ground trail is marked with yellow stripes painted here and there on the slickrock. At the time of this post the entire length of the trail hadn't been painted yet but there were enough cairns to follow to make up for it. After crossing the Alaska trail the route enters a small wash and continues its gradual climb up the bluffs. There are numerous potholes in the slickrock along the way. Some of them look big enough to take a bath in. Dinosaur tracks begin appearing at the 1.63 mile point of the hike. Once you get to the slickrock keep your eyes peeled and pay close attention to the cairns. Many of them are stacked next to the more distinct tracks. A lot of the tracks are only partial imprints and in some places there are tracks on top of other tracks. After reaching the first tracks keep following the cairns and explore the slickrock over the next quarter mile. 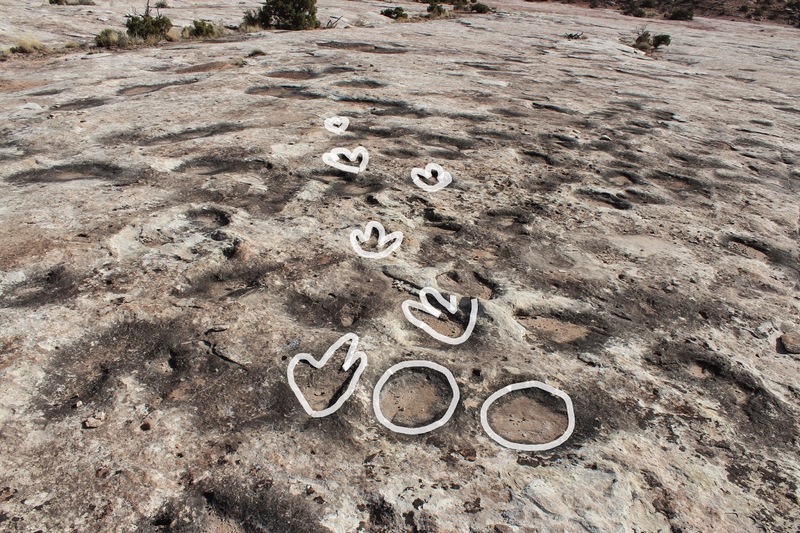 There are several different areas where there are clusters of various type of tracks. At about the 1.86 mile point the trail leaves the slickrock and continues the rest of the way up to the top of the ridge where it meets the Alaska trail again. There aren't anymore tracks at this point but the view of the Salt Valley with Arches National Park in the background is well worth the extra little distance. The Klondike Bluffs area is known mostly for its excellent mountain biking trails. The Copper Ridge Dinosaur Trackway site and the Dinosaur Stomping Ground are the exceptions and they are also becoming well known. We have also come across a few solitary tracks on a couple of the mountain bike trails as well as some well known tracks about a couple miles away near the south end of the Klondike Bluffs. If you would like to see it for yourself then all you have to do is 'Take a hike'.